WHO CAN APPLY FOR O-1 VISA? An O-1 visa is a nonimmigrant-working visa for aliens of extraordinary ability. U.S. Citizenship & Immigration Services (USCIS) classifies aliens in the arts as O-1B. To successfully apply for this visa, aliens in the arts should be prominent in their field. To establish prominence the artist (also known as the beneficiary of the petition) must have evidence of public acclaim and distinction. This includes published press about the beneficiary, or evidence of exhibitions or awards. Prominence is also established with recommendation letters from experts in their field, which will also support the beneficiary’s credentials in other ways. How Long Can I Stay with an O-1 Visa? O-1 visas are issued for a maximum of three years. After that, O-1 visa status can be extended on a year-by-year basis. Beneficiaries can also apply at the U.S. Consulate in their country to extend their visas in three-year increments if they can show they have three years of new events scheduled. Successful applicants should be prepared to justify why they need to be in the U.S. for three years to complete an event (or series of events). A three-year itinerary of events will be prepared, and these events should be confirmed in writing. An example would be a letter from an art gallery that confirms that the artist will continually exhibit at the gallery over the three-year period. To apply for an O-1 visa a foreign national must have an employer in the U.S. or a U.S. agent as his or her petitioner. Foreign nationals are not allowed to self-petition for an O-1 visa. You, the foreign national, are considered the beneficiary of a petition filed by someone else – your employer or U.S. agent. An employer agrees to pay you directly for your services, and in many instances the employer will withhold certain taxes from your earnings. This is a traditional employment relationship and works very well with professionals who are traditionally employed by a company, firm or institution. Examples include architects and museum curators. There are also instances where a company is a petitioner and the beneficiary is an independent contractor (where taxes are not withheld and the artist files his or her own taxes at the end of the year). Employment can be full-time or part-time. The employer can confirm a series of assignments at a specific rate, or it can confirm a range of assignments and even a range of rates. USCIS has been shown to be extremely flexible with their acceptance of a variety of relationships. But a key to successful application is having these confirmed assignments stretch over the entire duration of the visa period. A U.S. Agent represents you in occupations where you have more than one employer or are receiving confirmed assignments from more than one entity. U.S. Agents sometimes receive a fee or commission for representing the artist. Some professionals work with artist representatives. Commercial photographers, illustrators and musicians often have artist representatives. An artist representative can serve as a U.S. Agent—but not all U.S. Agents are artist representatives. Some U.S. Agents will solicit work for an artist (for example an artist representative) while other U.S. Agents are not looking for additional work for the artist but are merely confirming the assignments with multiple entities that are required by the O-1 petition. It should be noted as well that there are instances where an employer could additionally serve as a U.S. Agent, thereby allowing a direct employment relationship and also the ability to perform services for other entities. Contract between artist and U.S. Agent: The beneficiary (artist) and petitioner (U.S. Agent) sign a written agreement detailing the terms and conditions of their U.S. Agent-artist relationship. Contract between artist and employers confirming the assignments in the U.S.: The companies that will be confirming the events with the artist will sign an agreement that will be submitted with the visa application. This agreement describes the work to be performed by the artist, rate of pay, number of projects per year, and other terms and conditions of the assignment. This agreement will also acknowledge that the artist is represented by an U.S. agent, and that this agent will represent both the artist and employer for work performed by the artist in O-1 status in the United States. Performed and will perform services as a lead or starring participant in productions or events that have a distinguished reputation, as evidenced by critical reviews, advertisements, publicity releases, publications, contracts or endorsements. Achieved national or international recognition for achievements, as shown by critical reviews or other published materials by or about the beneficiary in major newspapers, trade journals, magazines or other publications. Established a record of major commercial successes or critical acclaim, as shown by such indicators as title, rating or standing in the field, box office receipts, motion picture or television ratings and other occupational achievements reported in trade journals, major newspapers or other publications. Received significant recognition for achievements from organizations, critics, government agencies or other recognized experts in the beneficiary’s field, with the testimonials clearly indicating the author's authority, expertise and knowledge of the beneficiary's achievements. A salary or other remuneration for services that is high in relation to others in the field, as shown by contracts or other reliable evidence. To satisfy this category you must have either won or been nominated for a major national or international award. The regulations mention Academy Awards, Emmys and Grammys. If you have won an award that is not at this level of a major national or international award then USCIS will most like consider that your award is insufficient for this category. Immigration will most likely not consider grants, residencies, or fellowships as satisfying the awards category. The current trend is that immigration rarely gives credit for the award category. On the other hand, evidence of grants, residencies and other awards are still very important because they help to show your significance. 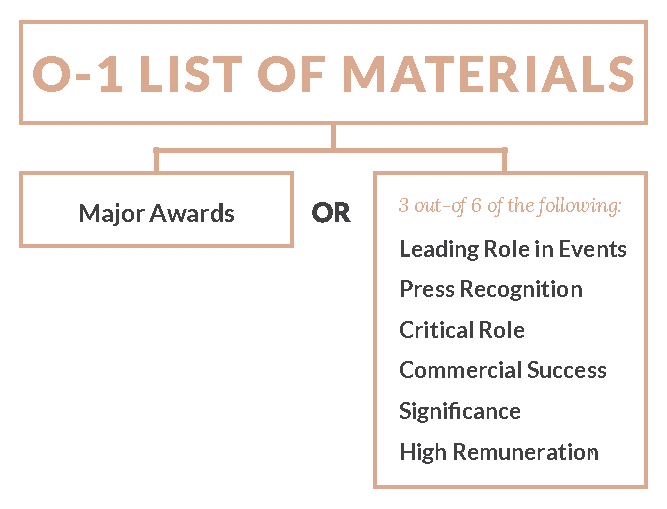 For this category you must prove that you have had a leading or starring role in events that are considered prestigious. You must also prove that you will be coming to the U.S. to have a lead or starring role in events that are considered prestigious. An event is something that occurs at a specific time. For example think of a performance in a concert, an artistic exhibition, a runway show, a lecture or a workshop. Judging the work of others can also be considered an event. Events can be documented as prestigious with articles about the event that mention the artist’s name. Press releases, invitation cards, catalogs and online mentions sometimes, but not always, prove that the event is prestigious. Promotional material about the event such as advertisements or posters can possibly prove that the event is prestigious. Most visual artists that are ready to apply for an O-1 have had multiple exhibitions, including solo and group shows. In the past, they could satisfy the events category with invitation cards and a press release about an exhibition. Now (and in recent years) USCIS also looks for clear evidence that the artist had an important role in the exhibition and that the exhibition was in some sense prestigious. To prove that the artist will have a leading role once they are in the U.S. we often look for press about the venue of the confirmed future event. For example, an art gallery that has been mentioned in the New York Times would be prestigious. We also look for press about the clients that the artist will work for (if the applicant is an art director, for instance). The key to this idea is to document that you are coming to the U.S. to do something and that there is some sort of evidence that this is prestigious. This can be accomplished by showing the venue is prestigious, that the actual event is prestigious or that the clients you will work with are prestigious. The regulations specifically mention major newspapers, trade journals and magazines as satisfying this category. Put simply, good evidence in this category will include articles about the artist in newspapers that have a national circulation, magazines that have a wide following or trade journals. Feature articles about the artist are most favored. The artist should be prepared to show circulation information or other evidence that the publication is considered important. Online articles and articles in local newspapers and less well-known magazines may not satisfy the press category, but they can still add value to an application. They may for instance show that events reviewed are prestigious or otherwise add up to demonstrate the artist’s prestige. Some artists, such as photographers and illustrators, will have their name credited with their work in a magazine. Note as well that the artist can satisfy this category with published material that they write themselves. For example, an art critic often writes articles that appear in magazines and newspapers. A discussion of the artist’s press with Eric and his team is essential to satisfy this category and to fortify the application overall to demonstrate the prominence of the artist. This category has two parts. Applicants must prove that they have had a leading, starring or critical role with organizations that have a distinguished reputation. They must also prove that they will have this relationship with organizations in the US. For the first part of this category, letters from former employers, clients or collaborators may often demonstrate past critical role. Artists such as designers, architects, illustrators and photographers can satisfy this requirement with testimonial letters followed by materials that demonstrate the relationship. For designers, those materials can be portfolio evidence. For photographers this can include print advertisements. It should be remembered that portfolio materials or commercial print advertisements alone do not demonstrate the critical role. These must be accompanied by some sort of confirmation of the artist’s involvement with the project. Hence the letters that confirm the critical role are critical and essential to proving this category. Visual artists can often get a letter from art galleries in other countries that represent them. This category is often confused with the events category described above. For the critical role category the artist must demonstrate a critical role with an organization. For the events category the artist must demonstrate a leading role in an event. There may be some overlap but consider this example. A runway model can get a letter showing that he or she was a model on a particular runway show. The runway show is the event and the letter demonstrates the model’s leading role in that particular event. On the other hand, a letter from the fashion designer of the event can prove that the runway model had a critical role with that fashion designer based upon their work together. This letter can be potentially more expansive than the letter confirming the model’s role in the runway show. It can also discuss other activities with that designer (the “organization”) in which the model had a critical or leading role. The critical role category is a very important category for designers, illustrators, architects, art directors and photographers. It is the appropriate place to show work experience with employers and clients (the “organizations”). Often the critical role is demonstrated with letters of recommendation accompanied by supporting materials. For example an architect can get a letter from his or her former company. The letter describes the importance of the designer’s work with that organization. The portfolio of supporting materials may include 5 to 10 pages that show the designs in print or online press. Sometimes we will use portfolio materials in these supporting pages. Sometimes we will use press about the project to support the letter. In general this category would document commercial success that is public information. This can include box office receipts, album or book chart success, or articles in trade publications demonstrating commercial success or critical success. Critical success might be differentiated from significant recognition described below since this category would use objective public information about the critical acclaim and the recognition in the Significant Recognition category would come from expert letters or other evidence that might not be public information. To prove this category we often get recommendation letters from experts in the field to show that the artist is prominent. Recommendation letters will be the principal way that this category is documented, but we can also submit evidence of awards, residencies or grants. We can sometimes show evidence that the artist is collected by institutional collectors such as museums. In our office we don’t want recommendation letters to merely say an artist is “the best.” Instead we want the letters to explain why the artist is the best. Our office has a proven track record of helping artists receive letters that are best tailored for their applications and what is needed in this category. Artists can show that they are prominent by demonstrating that they sell their work at a high price compared to other artists, or that they are well compensated, or that their work is commercially successful. We can sometimes demonstrate this by providing letters from accountants or letters from the company supplying the compensation (for example a letter from a gallery confirming high prices for artwork and/or a summary of work sold). According to USCIS regulations, all O-1 visa applicants must receive a no-objection letter from a union if there is a union of that profession. Unionized professions include professional musicians, who generally apply to the American Federation of Musicians for this type of letter. For professionals including fine artists, curators and architects, there is no union, and the applicant can receive a letter from an expert in the field with standing to offer an opinion. This is called a Peer Advisory Opinion Letter. The regulations for this category sound very intimidating but for our firm this is just an additional element that we have to address in putting these files together. 1. You must have a petitioner. 2. You must have confirmed assignments for the term of the visa. 3. You must qualify for the visa. CONFIRMATION LETTERS: A confirmation letter can confirm an award if you do not have an award certificate or other proof that you received the award. It can also confirm a lecture you gave, a high fashion model’s participation in a runway show, or another type of event. These letters will be discussed with Eric on a case-by-case basis. CRITICAL ROLE OR CONTRIBUTIONS LETTERS: The purpose of these letters is to confirm that you played a critical role with a person, organization, client or event. They can also confirm an artistic collaboration. SIGNIFICANCE LETTERS: These are letters from experts in your field who can attest to your significance in your field. While critical role letters will focus on the relationship between the artist and the writer of the letter, significance letters will be broader. They will describe the writer’s expertise and then offer an opinion about why the artist is significant in the industry. These letters will essentially describe all of the artist’s credentials and career to describe how the artist is prominent. Translations The regulations regarding translations are quite clear. All evidence that is submitted must be submitted with a complete translation. All translations should be accompanied by a certification from someone who is fluent in both English and the original language. Before translating all articles or other evidence a consultation with Eric’s office can give guidance on what is important and needs translation, and what might be considered less important and would not make it into the final application. Once the evidence has been obtained to document that the alien is extraordinary, and our firm is aware of whom the petitioner will be and the alien’s planned itinerary in the United States, we then prepare the forms and cover letters that immigration will need to approve the application. Often our firm needs time to organize the file. We then have the petitioner sign these documents and return them to us. We are then ready to send the file to immigration. When USCIS receives a file they can approve an application, they can deny an application or they can ask for more evidence. Requests for evidence from USCIS can ask for evidence to help clarify that the artist is in fact extraordinary or to seek clarification about what an artist will be doing in the United States. Once USCIS approves the petition they issue Form I-797 Approval Notice. Our office will work with the artist on a consular form called DS-160. This application for the US State Department will ask for biographical information and will inquire about prior visas, and seek to uncover any problems that make an applicant ineligible for a visa. Once the DS-160 has been prepared and generated our office will prepare a packet for the applicant that will include a copy of the petition, an updated letter from the petitioner, a copy of the DS-160 consular form with bar code and the Approval Notice I-797. Additional documents needed may include pay statements from past employers, old passports or other evidence of prior immigration status including I-20s, EAD cards and old approval notices. In most instances applicants are required to schedule a personal interview at the consulate. This is often not an actual interview, but an in-person appearance at the consulate. Given the heightened border security measures currently under effect, the United States Consulates are on the defensive. They do not want to make a mistake, and the level of scrutiny on applications is at an all-time high. Our office is aware of this complication and we work intensively with all applicants to complete all relevant documentation. Most often, the consular officer will take the passport and the related evidence and review it. The officer will then return most of the evidence and keep the passport. If the visa is to be issued, the passport is often sent back to the applicant by courier or mail in a period of time ranging from one day to three weeks, depending on the consulate and the time of year. All applicants are screened for prior arrests and a terrorist watch list. If, as is sometimes the case, an applicant triggers a flag in the database search the consulate will not issue the visa until the issue is resolved. In the case of a mistake this may take a number of weeks or months. If you find yourself in this situation, we will work with you to attempt to resolve it. Through careful screening most issues can be identified at the beginning of the application process. In the case of a mistake, patience and persistence are our principle tools. While the consular sections can make mistakes, they are also fair and they will most often resolve them favorably. This is yet another reason to apply sooner. After Visa Issued From Consulate - Entering the U.S.
BORDER INSPECTION: Our office advises applicants to take the entire packet that the applicant brought to the consulate with them on the plane in case U.S. immigration officials at the border have any questions about the visa. For example, they may ask about the artist’s credentials and ask what the artist will be doing in the U.S. for the petitioner. When an applicant is already in the U.S. on a visa and wants to switch to O-1 status, the applicant must decide whether to change their status in the United States or apply directly at the consulate. If an applicant has a valid visa and is in status, they may have the right to apply for a change of status to O-1. The advantage is that if the USCIS approves the petition, the beneficiary is then considered to hold O-1 status as opposed to the status they formerly held. For example if they had F1 Student status and filed for change of status upon approval they would be in the US in O1 status. They may begin working for the petitioner and they have the right to stay in the U.S. for the duration of the time approved by CIS. The disadvantage is that this can become extremely complicated and can potentially convolute a petition that is otherwise approvable. In determining whether to grant a change of status, USCIS takes all elements of an applicant’s current status into account. In some instances, the applicant’s current status may prejudice the officer who reviews the application. For example: How can a student apply for an O-1 visa? In actuality, many MFA grads in optional practical training may qualify for an O-1 visa, yet applying for a change of status may affect the results of the petition. At the same time the artist will still need to have a consular interview if they travel outside of the US after approval. Eric Shaub almost always recommends consular processing. In the United States we have an expression: “moving the goal posts.” This expression originates from games played with a ball on a field, but it is an apt metaphor for the experience of immigration attorneys who have prepared O-1 visas over the past few years. As recently as 2008 artists were free to prepare their own itineraries to demonstrate what they intended to do in the U.S. In 2009 USCIS made the determination that all events should be documented with contracts. Then in 2014 USCIS became much stricter regarding the evidence of an artist’s career. For example, in the past applications could succeed with limited documentation about an artist’s participation in events, but the emphasis has shifted now to proving that those events are prestigious. USCIS also wants evidence to prove that the artist will be performing in prestigious events in the United States once they arrive. The additional paperwork involved in documenting these activities could easily result in a “monster” size application that would be confusing and redundant—and large files are not something immigration is necessarily fond of either. Sometimes we have no choice but to submit enormous files, as there is no concise way of documenting all of the elements. That being said, our focus should be not on creating the biggest file. It should be on creating the best. During the application process Eric should be made aware of any immigration problems and any criminal activity—including all arrests anywhere in the world. Prior immigration problems and criminal activity can affect an applicant’s eligibility for the visa. Spouses and children of O-1 visa holders can receive a visa called O-3. It does not allow employment but it does allow the spouse or child to live with you in the U.S. through the duration of your O-1. While it is often possible to apply for a visa in a country besides the applicant’s home country, this office recommends the home country. Other consulates often have the opportunity, but not the obligation, to issue the visa. If they choose not to issue it the applicant must get on a plane and fly to their home country. In the opinion of this law firm, all successful applicants for an O-1 visa should obtain a social security number after they enter the U.S. on an O-1 visa. O-1 visa holders are obligated to pay taxes on the income they earn in the United States. Some countries have tax treaties with the United States that determine where they pay tax. Ultimately a determination of tax residency relates to the number of days an alien spends in the U.S over a period of time. Permanent residents are obligated to pay their global tax in the U.S. Eric Shaub is not a tax attorney, nor is he a tax professional. The opinion here is presented to offer a starting point in the discussion of taxation. Taxation is a separate topic from immigration and all visa applicants are advised to get appropriate opinions from trusted tax professionals. In many instances, students or exchange visitors who receive grants or scholarships may enter the U.S. on a J-1 visa. If this is the case, they may be subject to Section 212E which requires them to return to their home country for a period of two years before applying for types of visas including immigrant visas (green cards), H-1B visas and L-1 visas. The good news is that if they qualify, J-1 visa holders are not prevented from applying for an O-1 visa. They are not eligible for a change of status, but if the petition is approved, they are eligible to apply for the visa at a consulate outside of the United States. To satisfy this category you must have either won or been nominated for a major national or international award. The regulations mention Academy Awards, Emmys and Grammys. If you have won an award that is not at that level of a major national or international award then USCIS will most like consider that your award is insufficient for this category. Immigration will most likely not consider grants, residencies, or fellowships as satisfying the awards category. The current trend is that immigration rarely gives credit for the award category. On the other hand, evidence of grants, residencies and other awards are still very important because they help to show your significance. For the first part of this category, letters from former employers, clients or collaborators may often demonstrate past critical role. Artists such as designers, architects, illustrators and photographers can satisfy this requirement with testimonial letters followed by materials that demonstrate the relationship. For designers, those materials can be portfolio evidence. For photographers it can include print advertisements. It should be remembered that portfolio materials or commercial print advertisements alone do not demonstrate the critical role. These must be accompanied by some sort of confirmation of the artist’s involvement with the project. Hence the letters that confirm the critical role are critical and essential to proving this category. Visual artists can often get a letter from art galleries in other countries that represent them. For example an architect can get a letter from his or her former company. The letter describes the importance of the designer’s work with that organization. The portfolio of supporting materials may include 5 to10 pages that show the designs in print or online press. Sometimes we will use portfolio materials in these supporting pages. Sometimes we will use press about the project to support the letter. According to USCIS regulations, all O-1 visa applicants must receive a no-objection letter from a union if there is a union of that profession. Unionized professions include professional musicians, who generally apply to the American Federation of Musicians for this type of letter. For professionals including fine artists, curators, photographers and architects, there is no union, and the applicant can receive a letter from an expert in the field with standing to offer an opinion. This is called a Peer Advisory Opinion Letter. The regulations for this category sound very intimidating but for our firm this is just an additional element that we have to address in putting these files together. The contents of this website may contain attorney advertising under the laws of various states. Prior results do not guarantee a similar outcome.